LeVar Burton’s Kickstarter to create a Reading Rainbow presence online. Photo from Reading Rainbow, Kickstarter. Update, May 29, 10:45 a.m.: Wow, the Internet was all over this on Wednesday. The Reading Rainbow Kickstarter reached its $1 million goal by 8 p.m. on its launch day and has now raised more than $1.7 million. May 28, 4:35 p.m.: There are two Reading Rainbow theme songs. The one that is obviously superior and the other one. Fortunately the show was great during both eras (1983-99 and 1999-2006 respectively). And even better, Reading Rainbow may come back in yet another incarnation, this one digital. After new episodes of the show ended in 2006, and then reruns stopped airing in 2009, a team including LeVar Burton got to work on a new direction, and the Reading Rainbow iPad app debuted in 2012. Though it’s been a big success, the new goal is to expand Reading Rainbow’s library and reach so it can accessible through any browser, instead of just on tablets. 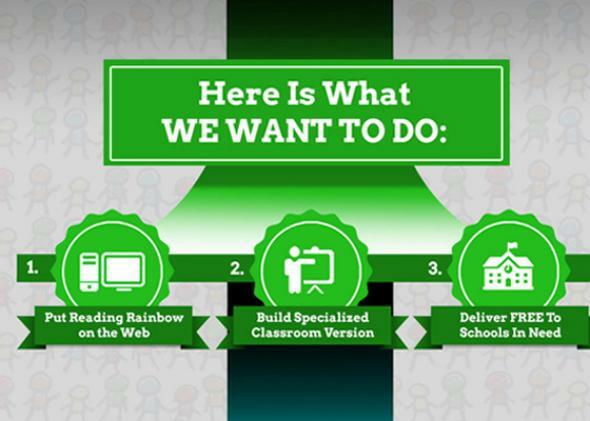 Illiteracy rates are still a major problem in the U.S., and the Kickstarter promises that if Reading Rainbow achieves its funding goal, it will give free online services to at least 1,500 needy classrooms. The Kickstarter launched Wednesday morning and has already topped $600,000. By the way, some of the Kickstarter rewards are Star Trek-related. For example, five people who donate $10,000 each will get to wear the Geordi La Forge VISOR. Run, don’t walk.